Not all cables and adapters are created equal! After many complaints were received by DisplayPort.org, they did a series of tests where they bought many of the no-name cables & adapters to test them out. The results were scary: a very high percentage of those cables and adapters didn't function as intended and either gave blank screen, or sent corrupt packets to the monitors or simply didn't work in all standard scenarios. This means that you should only buy certified cables and adapters from reputable brands with very high quality reviews on websites like Amazon or other sites. From much research and by reading a lot of reviews, I've selected StarTech.com as a very trusted manufacturer of DisplayPort product and most products here will be from them. You may of course buy any other brands you wish, but just make sure to check the reviews. 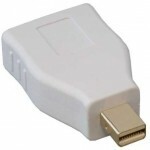 Note: avoid "one-piece" adapters as they will often not hold correctly or will simply not fit in cramped space. Go for adapters with 3" to 6" of cable like the ones recommended below. Note: If you are buying normal (passive) cables, then the total bandwidth of the cable will go down with length. Be sure to read the packaging specifications in case you want to connect 4K monitors or multiple 1920x1080 or 2560x1600 monitors. Usually, most cables of 10 feet or less will give you full bandwidth. There is no such thing. This is mostly due to misinformation: DisplayPort cables either carry the signal or not. Contrary to popular DisplayPort mythology, the more expensive cable will not give you a better picture quality. That being said, you should always buy certified cables. Note: All standard DisplayPort cables support RBR, HBR (High Bit Rate), HBR2 (High Bit Rate 2) and HBR3 (High Bit Rate 3), which can support 4K at 60Hz, or up to four or more 1080p displays using Multi-Stream Transport. Note that the maximum data rate depends on the length of the cable. Always check the cable packaging to learn more about the maximum bandwidth.